Yahoo Sing Out. Maximum people use yahoo mail service. But sometimes you need to log our of yahoo mail for your account security. It is important to sign our correctly to your yahoo mail account. Learn how to sign out of Yahoo! Mail account correctly. 1.1 1. Yahoo mail inbox. 1.2 1. Yahoo mail inbox. 1.3 2. Yahoo Sing Out from Yahoo email inbox. 1.4 2. Yahoo Sing Out from Yahoo email inbox. 2.1 1. Yahoo sign out page. 2.2 1. Yahoo sign out page. 2.3 2. Yahoo sign out from yahoo homepage. 2.4 2. Yahoo sign out from yahoo homepage. Yahoo mail inbox. When you stay your yahoo mail account email inbox then you will see your name with a man icon. This icon you see up-right corner of your yahoo mail inbox. 2. Yahoo Sing Out from Yahoo email inbox. Drug over your mouse pointer up to human icon. This icon you see up right corner of your yahoo email inbox. Then you will see few more options with Sign Out text. Click Sign Out text to sing out from your yahoo mail account. 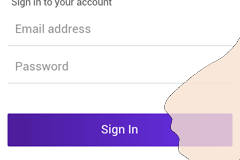 After sign out yahoo mail account you will see yahoo homepage without your name. 1. Yahoo sign out page. 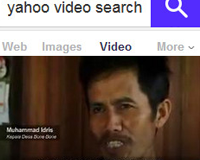 When you stay sing in yahoo mail account then you will your name with human icon. 2. Yahoo sign out from yahoo homepage. Drug over your mouse pointer up to human icon with your name. This icon you see up right corner, 2nd icon from right of your yahoo mail homepage. Then you will see more options with your name and Sign Out text. 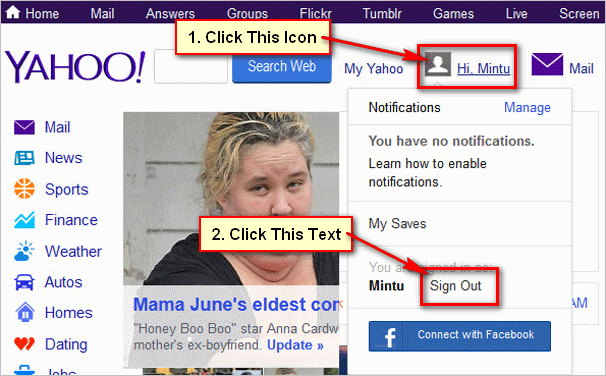 Click Sign Out text to sign out from your yahoo email account. After log out from your yahoo email account then you will see yahoo home page without your name. 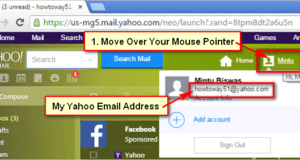 Using this way you can sign out from your yahoo mail account anytime for your yahoo email account security.